Public officials may not use their offices for personal financial gain. Holding public office does not entitle one to personal advantages or perks. Transparency promotes public trust and confidence. Because public trust and confidence is vital to the strength of a democratic system, ethics laws sometimes set very high standards for public official conduct. Even though public officials may feel at times that some of these high standards of conduct are unduly burdensome or intrusive of their private lives, they must accept that adhering to these standards, including broad financial disclosure rules for gifts and income, is simply part of the process of public service. The resources below will help local officials and staff navigate these laws and provide tips on how they can increase trust and transparency in their communities. Assuming a public office can be overwhelming. Here are five ethics rules every public official needs to know. 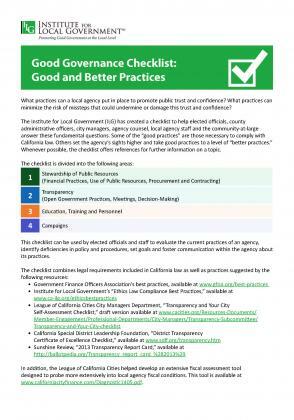 This resource outlines the good and better policies and practices that local agencies can put in place to promote and build public trust and confidence. 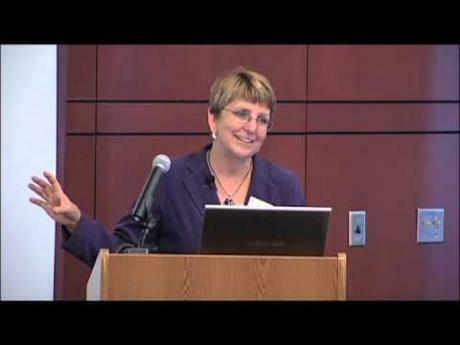 In this video former Institute director JoAnne Speers, discusses ethics principles and ethics laws and the difference between how local officials must act and how they ought to act. The “front page” test is analytically useful because it encourages a public official to think about how his or her actions might look to the outside world. A Leader’s Dilemma: Ethics versus Expediency? This article analyzes situations that might cause leaders to ponder whether the ends justify the means. Every two months, until the close of 2014, the Institute’s ethics program analyzed different ethical dilemmas public officials are likely to face. Some of the dilemmas have legal dimensions, some have ethical dimensions and many are a combination of both. The column appeared in Western City magazine, the monthly publication of one of the Institute’s parent organizations, the League of California Cities.